In a previous life, I was a Concept Artist/Illustrator for the gaming industry (I still do this sometimes but only on a remote, freelance basis). The first company I worked at was The Creative Assembly (SEGA), where I produced the Event Pictures for Shogun 2: Fall of the Samurai. Several pages of my work can be found in The Art of Total War or on my personal art blog. My experience there left me well-versed in the art of Japanese wood-block prints, which I applied here. The idea was to have a design that resembled traditional Japanese art with a modern twist, rather than imitate big, bold styles that originated from the Yakusa*. This was my first attempt with colour and I really wanted to go all-out, so I could learn lots before inking people. It’s a lot like traditional painting, and having grown up trying out different types of media, this wasn’t any different. It was easy to decide what to base Spring on, given that their national flower is the cherry blossom. It’s my favourite type of tree too, so I had fun inking this part in. 🙂 I used coloured lines (rather than black) throughout the sleeve for a softer and more vibrant look. It’s a technique Disney use that prevents the image looking too flat, which I think is the issue with using black outlines…unless you’re going for that look. Summer was a tricky season to represent. My first thought was a clear blue sky but a.) that can happen in any season and b.) it’s not very interesting compared to the other subjects. Eventually, I read somewhere that fireflies emerge during the Summer, so I depicted this in a silhouetted forest scene. 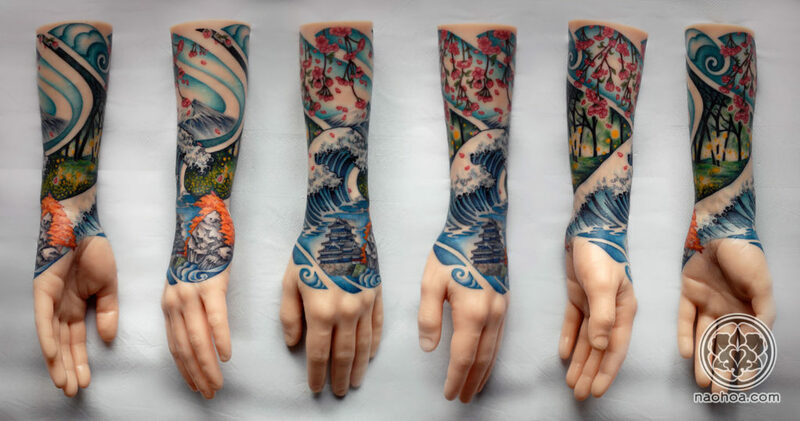 I was concerned it wouldn’t fit into the rest of the sleeve, being so dark, but over time it grew on me and serves as a contrast in light and colour palette. Trees look fabulous in Autumn, and I was delightfully surprised in how easy it was to portray bunches of leaves with simple lines. I drew a loooooot of clouds and waves during my contract at The Creative Assembly, to the point where people would call them “Naomi Clouds”, which was cute. 🙂 “Naomi Swirls” were a thing too, hah. Winter was another tricky one. I knew I wanted to feature Mt. Fuji, which always has some snow on the peak and figured it would be a clear and easy way to portray the season when covered in snow. I added a cooler, brighter hue of blue/turquoise to give the surrounding patch of sky an icy chill…subtle details like that can be nicer than big, literal ones, I think. For example, slapping a snowflake on top would be too much, imo, and distract from the overall image. 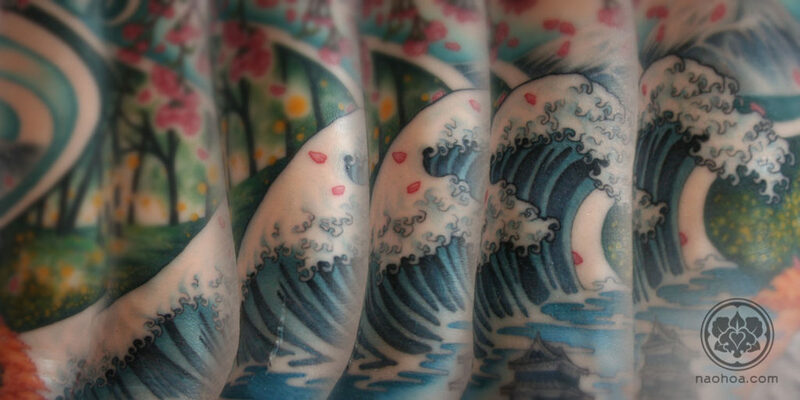 I’m aware that Hokusai’s ‘The Great Wave off Kanagawa‘ is hugely popular as a tattoo as well as a print, so I wanted to feature this in the sleeve for solid practice. 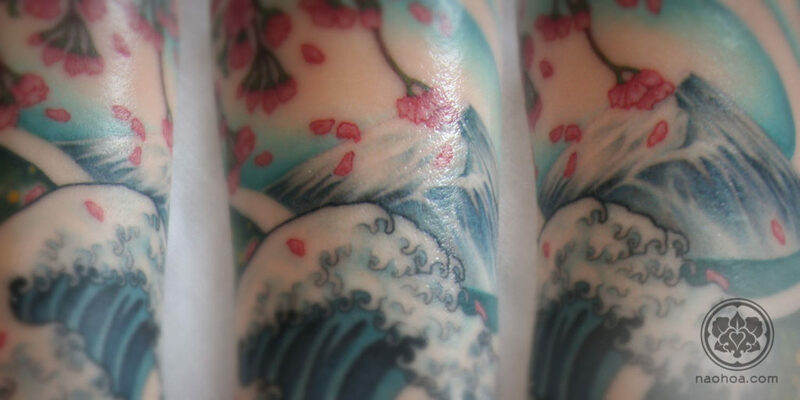 I noticed a lot of tattoos neglected the subtle shading on the outer waves, so I added some in blue for my version. It’s a tiny detail that adds a lot to the image, I think. Having studied his work for Shogun 2, it was already embedded in my brain anyway! It’s been around two years since this piece was completed. I started practising on my desk in the spare room and carried on working on it in the studio during late hours…because parking in Cardiff is free after 6pm and I couldn’t afford to pay for a spot or didn’t know the area enough to find free ones. I put everything I had into this and setting up the studio, making as many sacrifices needed to make it all happen. It’s easy to forget about that sense of tenacity once it’s all done and bewildering to look back on. 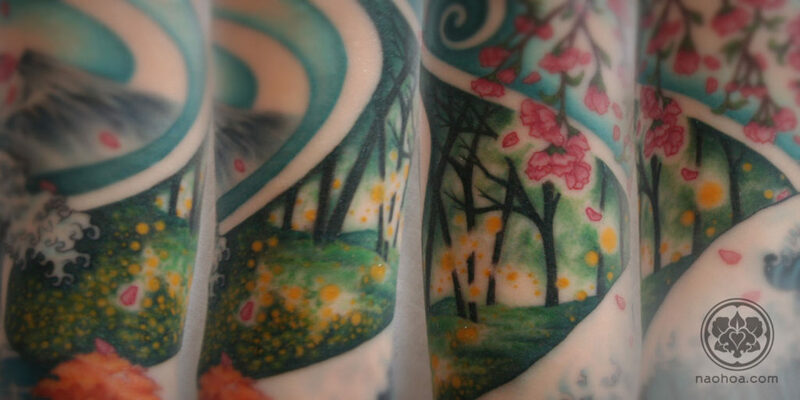 Behind The Scenes, Design, Tattoo Behind the Scenes, Cardiff, Cherry Blossom, Creative Process, Design, Illustration, Japanese, Japanese wood block print, Mt. 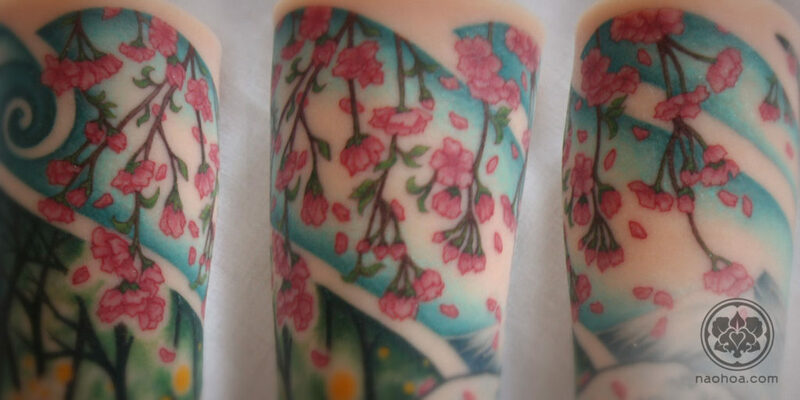 Fuji, Original Design, Sakura, Tattoo. permalink.